The Samsung Galaxy Tab 3 Kids is an Android tablet specifically designed for children. The colourful, well designed device is a little expensive and is best utilised with an additional cost accessory, but its kids user mode is a concept that hits the mark and will surely appeal to many parents. Child-friendly tech devices aren't anything new but these types of products have never really struck a chord with a mainstream audience. Samsung's new Galaxy Tab 3 Kids, a an Android tablet specifically designed for children, might be able to change that. The colourful, well designed tablet is a little expensive and is best utilised with an additional cost accessory, but its kids user mode is a concept that hits the mark and will surely appeal to many parents. Essentially a rebranded version of the Galaxy Tab 3 7. According to Samsung, the concept of the Galaxy Tab 3 Kids came to fruition from research that indicated children influence tablet adoption in Australian homes. Regardless of whether this is true or not, developing a kids tablet isn't as complicated as you might think — the Galaxy Tab 3 Kids is essentially a rebranded version of the Galaxy Tab 3 7, which was released in Australia back in July. It's been coated in a bright yellow colour instead of the standard white but is otherwise identical in both design and components. The design of the Galaxy Tab 3 Kids isn't very kid friendly on its own but Samsung includes a bright orange, silicone case in the sales package. It wraps around the tablet to protect the back, sides and front bezel, and doesn't block any ports or buttons, though it's a little awkward to slip on. The case provides excellent grip for the tablet, but won't protect the screen itself. We feel Samsung could have bundled a screen protector in the package as an added bonus. The Galaxy Tab 3 Kids becomes even more child friendly when you purchase the optional "Kid Grip Cover" ($69.95). It's a hard plastic, protective case that includes a rotatable stand and handle, and comes with a "C Pen" stylus. The green and yellow colour combination of the Kid Grip should certainly appeal to children, and the case itself feels well constructed and fits the tablet snugly. The thick stylus should be comfortable enough for most children to use effectively. The rotatable handle/stand is a particular highlight as its easy to prop the tablet up on a table, or even on your lap. The C Pen stylus is also a nice inclusion. The thick stylus should be comfortable enough for most children to use effectively, and the wide, rubber tip allows for the easy selection of most on-screen menu items, particularly opening apps. It's a shame Samsung doesn't bundle the case and stylus into the package instead of selling it as an expensive accessory. The Samsung Galaxy Tab Kids has a 7in screen with a resolution of 1024x600 pixels. While this is certainly no match for the best tablets on the market, it is adequate for children's use. The AMOLED panel offers excellent viewing angles and bright colours, but the relatively low resolution means text isn't as crisp or clear as many other devices on the market. Further, we found the automatic brightness setting erratic, often setting too high. The dual speakers on the bottom are reasonably loud and work well enough for most of the games on board, though they lack bass and do distort at the highest volume level. A grab-and-go feel to the device makes it appealing. The killer feature of the Galaxy Tab Kids is a dedicated Kids Mode that transforms the complete look and feel of the software. The device can be set to boot directly into this Kids Mode user setting that provides access to a seperate Samsung Kids Store. 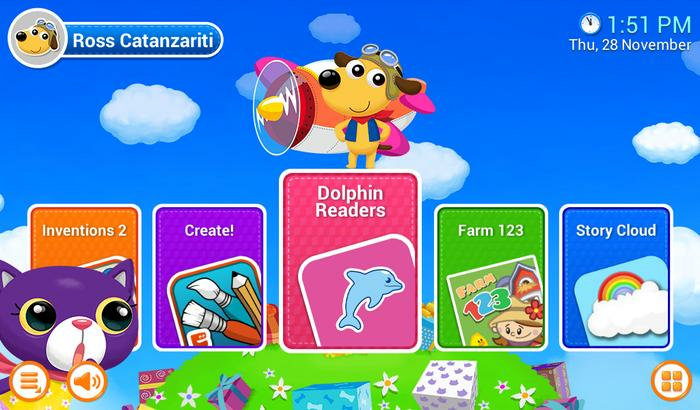 It contains apps that have been developed to help support children's entertainment and early learning for users three years old and above. Out of the box, the device comes pre-loaded with a number of games, e-books, and education and entertainment apps, so there's a certain grab-and-go feel to the device that definitely makes it appealing. The Kids Mode home screen immediately presents a list of installed apps in a carousel based interface. You can add a maximum of 20 "cards" on this screen, with other apps available in the applications menu, which is a basic grid of icons that's been spruced up with bright colours and large icons in order to appeal to a younger demographic. 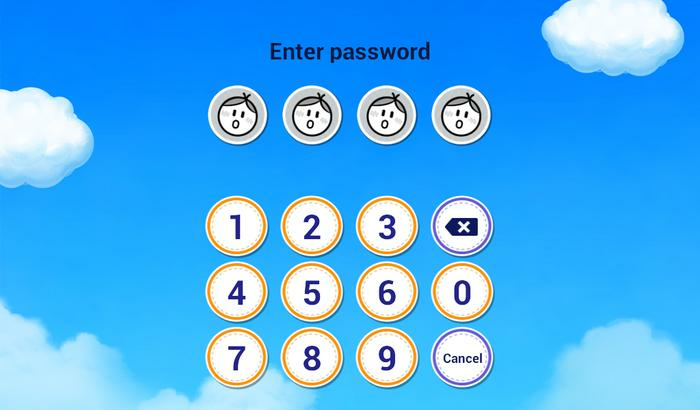 The home screen is animated and has music playing in the background, and users can set a name and a profile picture for the mode. One feature missing is multiple kids user profiles. Although multiple children can effectively share the Galaxy Tab 3 Kids, it would have been nice to have seperate kids accounts, each with their own preferred apps on the main carousel. I'm sure parents with more than one child will agree. Multiple kids accounts may just be the only useful setting that's not available on the Galaxy Tab 3 Kids, however. The list of settings is seriously extensive, headed by the ability to set a usage time limit of between 10 minutes and one hour and 20 minutes. A password protected lock screen then prevents use when the allotted time period is up. Parents or guardians can also set a specific time period for use, for example between 5pm-8pm, and can even set up the device to be always locked, requiring a four digit passcode to use at all times. The Kids Mode is very flexible. 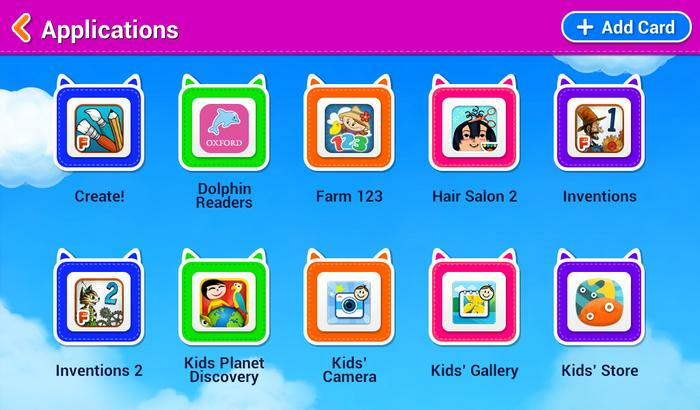 Parental controls allow users to choose which applications can be accessed in the mode, so you're not restricted to the apps that are available in the Samsung Kids Store. If you choose to, you can enable any app you've downloaded on the device to be accessible in Kids Mode — yep, even games like Dead Trigger 2 and GTA III. There's also a setting that will add all downloaded apps to kids mode automatically. Naturally, the Galaxy Tab 3 Kids requires a four digit passcode to be entered when purchasing both free and paid apps, so there's no risk of your child racking up a huge bill, or churning through your Internet download limit. Limited specifications result in a frustrating user experience. While the Galaxy Tab 3 Kids is primarily designed to be used by children, a seperate standard mode setting offers the same features and functions of a regular Samsung Android tablet. In this mode, the limited specifications of the tablet do result in a rather frustrating user experience. The 1.2GHz dual-core processor and 1GB of RAM clearly isn't enough to keep up with the demand of the Android operating system and Samsung's TouchWIZ UI. Even basic tasks like swiping through home screens, pulling down the notifications panel and opening apps is a sluggish and often jerky experience, while playing any sort of graphically intense game results in slow frame rates and longer loading times. The Galaxy Tab 3 Kids comes with 8GB of internal memory but a microSD card slot allows users to expand the on-board memory. The tablet has a 3-megapixel rear-facing camera, and a front-facing 1.3-megapixel snapper that takes poor quality photos and video, though it should be good enough to keep the kids entertained. In a nice touch, Samsung has skinned the camera application when opened in kids mode, with larger, more colourful icons, and parents can select which folders of images, videos and other files can be accessible in Kids Mode. The Samsung Galaxy Tab 3 Kids has a large, 4000mAh battery that should last about six to eight hours of constant use. In our experience, the battery does drain quite significantly when the screen is on, even when used purely in Kids Mode. We recommend turning the brightness to a lower setting to try and extract as much battery life as possible. The Samsung Galaxy Tab 3 Kids is available now in Australia and sells for $299 outright. It is stocked at Samsung's Experience Stores in Sydney and Melbourne and is also available through various other retailers across the country.